Nine have been entered to go a mile at Oaklawn Park in Friday's Smarty Jones Stakes, and the contest has attracted the top two from the Remington Springboard Mile as well as the winner of the Sugar Bowl Stakes. FREE Brisnet.com PPS for the Smarty Jones Stakes! This dual stakes winner rides in on a three-race win streak overall. The consistently good colt has trained well locally and draws the rail for this assignment. The Kentucky-bred is a versatile contender in search of a fourth straight. This second timer closed from off the pace to win on debut in October at Remington Park. An unknown quantity, he picks an ambitious spot for his return and would be a surprise off the shelf. This interesting sort was a superb allowance winner at Churchill Downs prior to a fourth-place showing in the Sugar Bowl Stakes most recently at Fair Grounds. The late-running colt makes his two-turn debut and will be showing late interest in his second stakes attempt. The gelding tops the field with seven races to date and exits his best result when annexing the Big Drama Stakes at Delta Downs. The Kentucky-bred finished last in his previous black-type race but shows a few swift drills at Oaklawn Park of late. He will be stalking the pace early on. The $700,000 juvenile purchase was a gamer winner on debut at Keeneland prior to running second in a subsequent allowance dash in the slop at Churchill Downs. The Virginia-bred colt makes his initial route try and is coming up to the race well with a pair of bullet works on the surface. He could be a sleeper at a nice price. The Virginia-bred contender comes off a lifetime-best performance with an allowance tally in the slop at Churchill Downs. The colt has trained forwardly in the interim for a smart layoff barn. He will be doing his best work from off the pace in this endeavor. 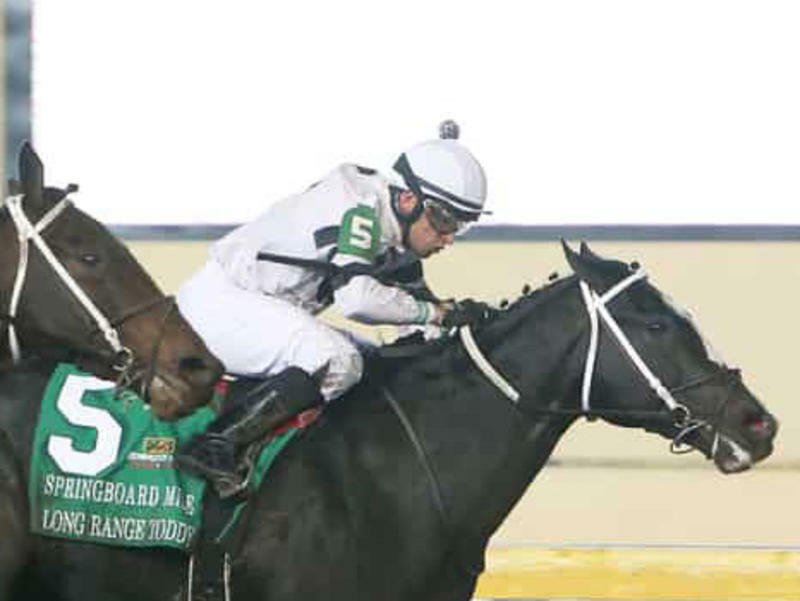 The stakes winner nearly went last-to-first when a head second in the recent Springboard Mile Stakes. The $260,000 two-year-old purchase has been consistently good and has shown his versatility in running from off the pace in two straight races. This top contender is a must use here. The surging son of Graydar was a fine winner of the Sugar Bowl Stakes last out and was flattered as the two he beat came back to place in the Lecomte Stakes (G3) on Saturday. The Kentucky-bred has improved his BRIS Speed figures with every career start. He could be the one to catch in his two-turn bow. This speedy sort lacks consistency while drawing widest in the field. The bay colt looked sharp in a Breeders’ Cup weekend maiden score, though his subsequent allowance test left something to be desired. The sophomore will be forwardly placed once again.